We're Doing it Again but BIGGER! 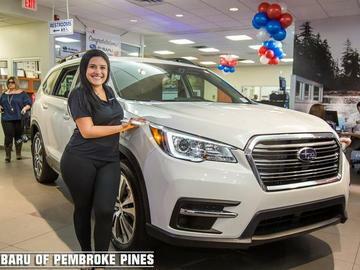 Subaru of Pembroke Pines, Florida´s #1 Volume Subaru Store* is celebrating its Official Subaru Ascent Launch Event on Sunday, September 16th, beginning at noon! The Young at Art Museum will be creating Foil Butterflies by upcycling old art (from famed artist Joe Winograd's exhibit) and creating new art. They can hang the butterflies as mobiles or in the SUV’s rear-view mirrors. 2019 Subaru Ascent features 3-roomy rows for an up to eight-passenger capacity, and 5,000 pounds of towing power! Love is not only bigger than ever; it’s ready to haul a whole lot of family fun! Request your tickets to this event on or before September 14th to receive an additional $500, non-expiring certificate towards a new 2019 Subaru Ascent. This is a FREE FAMILY AND PET-FRIENDLY EVENT!